Hawaii Travel Agent. We make is easy to book your Hawaii vacation. Enjoy 5 star customer service when you book through our best Hawaii travel agent. We work for you to arrange a travel package that is exactly what you have in mind! Hawaii Vacation Guide. Visit 2, 3, or 4 islands with flights arriving into one island and departing out of another island. Whichever islands you want to visit the itinerary will be arranged to include air, including inter island air, hotels, cars and insurance. Complete the quote request form or call for a quick quote by phone. 20 years of experience as a Hawaii travel agent. We will create a unique multi-island package for up to 4 islands. Choose from luxurious resorts or family sized condos at ocean front properties. Include activities and tours to historical sights, ocean adventures and entertainment. 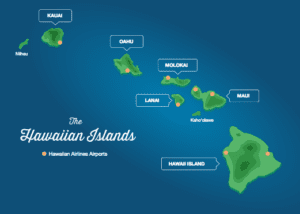 Select your unique resorts and include all flights, including inter island, in your package. Payment plans and travel Insurance are include in the package arranged by our Hawaii Travel agent. You don’t need to search for the best deals. Hawaii Multi island and cruise packages arranged for the price you have in mind. You will benefit from my 20+ years of experience with booking Hawaii vacation packages. Get your package booked at the best price available. Call for a quote. Agent available mid day your time zone, 808-330-6865. Island Hopping is a popular way to see all of the islands. Arrange “Day Trips” to the neighbor islands for sightseeing and activities and return that same evening. Fly into one island and return from a different island with inter island flights and cars included in the package. For families and groups we offer resorts and condos with 1, 2 or 3 bedrooms and full kitchens. Our resources are available to you with links to details for every resort on every island. Book your cruise with Norwegian Cruise Lines through Travel Guide to Hawaii. 7 days Multi Island Cruise departing from Honolulu every Saturday. Package includes run trip air and activities and tours on every island. Free Honeymoon or vow renewal gift registry and a personal travel website is available for your special date. Your friends and family will appreciate the opportunity to select a wedding gift for your Hawaii honeymoon vacation. Did you ever go on vacation and decide that you never wanted to go home? My vacation became my vocation. I published the first Travel Guide to Hawaii web site in 1998. In 2001 I arranged for a Hawaii Travel Agent’s nationwide license. My first trip to Hawaii was to the Big Island. I stayed for the whole winter, camping and sightseeing. My vacation became my career and I hope you will contact me. I am certain that I can help you with your Hawaii plans, just call me. 808-330-6865 HAWAII TIME. Please feel free to call me, my name is Rose and I will make your Hawaii vacation great.